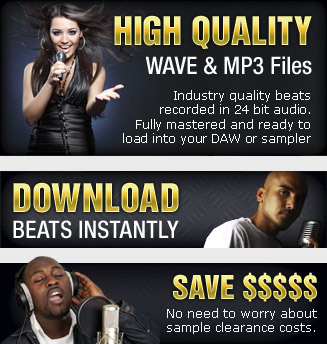 Get beats right to your in box and download WAVE files or MP3 immediately after ordering with Paypal. Our license is 100% royalty free. Beatlease.com brings to you the ILLest RnB Instrumentals, Hip Hop Beats and Rap Beats in all the dopest styles. We got East Coast, West Coast, Dirty South, Crunk, Gangsta Rap and more!!!! As soon as you complete your order you will be taken to a page where you can download your RnB Instrumentals. All of the beats that we sell come to you as high quality WAVE files and MP3 files. WAVE files offer you the best in sound quality and enable you to load the beat into your favourite software, DAW, sampler or MPC beat maker. If you've never leased beats before you should read our FAQ page to answer your questions. What am I allowed to do with the beats that I lease? For a full rundown of our license terms please read the License pagee. Imagine if you'd just paid ten grand for an exclusive beat only to discover that the main hook is a sample from an old Motown record. Chances are you'd just wasted your ten grand because it's going to cost a lot more to get clearance to use that sample - if you can at all. With our beats you don't need to worry about sample clearance. All of the samples used in our beats are 'pre-cleared', this can save you thousands of dollars and stress from costly law suites. How can we do this? Simple, we make our own samples from scratch or pay licensing fees to use those samples. Beatlease.com is owned by Kingpin Studios Inc, the same company that owns www.platinumloops.com and www.siliconbeats.com. This means we have access to high level production talent and the licensing leverage to use only the best royalty free samples in our beats. How many other beat libraries can offer you that peace of mind?